Welcome to the Park Pet Hospital. Please take a moment to browse through our services and read about our dedicated staff. 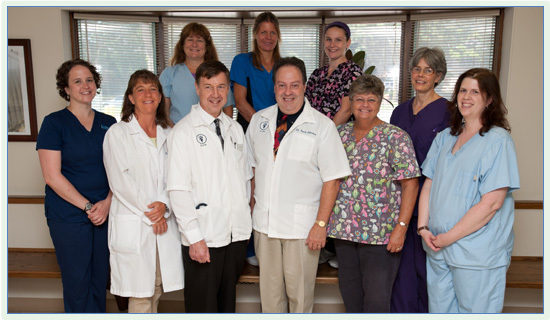 Our veterinarians and staff are committed to providing you and your pets with the finest in veterinary care. We will work closely with you to understand your pet's unique health care needs and will strive to develop diagnostic, treatment, and preventive plans that best meet your concerns. We are all pet owners ourselves and appreciate the importance of the unconditional love that pets bring to our lives. It is our goal not just to ensure the health and wellbeing of your pet, but to be your partner in strengthening the bond you share with your pet. The Park Pet Hospital was founded in 1957 by Dr. Gerald Rosen. Its name was chosen due to its location alongside Brown Deer Park. After several generations of serving Milwaukee's north shore communities, many pet owners have come to rely on us as compassionate, skilled practitioners and place their trust in our abilities to help their beloved companions. We recognize that providing the highest quality veterinary care includes keeping you, our clients, at the center of all we do, and know how important it is to be treated with respect by a staff that is knowledgeable, welcoming, and courteous. We pride ourselves on being diligent about promoting client education and responsible pet ownership, and hope that you'll give us a chance to prove ourselves to you. Please take a look around our website. Many of the veterinary services that we provide are listed along with bios of our doctors, nursing and receptionist staff. Then give us a call to set up an appointment today! Tuesday - Friday 8 a.m. - 6 p.m.
Our policy is that payment in full is expected at the time services are rendered. Estimates will be provided for hospitalized patients and financial updates can be given upon request. Acceptable forms of payment include cash, checks, and major credit cards (Mastercard, Visa, Discover and American Express). We also accept Care Credit, and will be happy to assist clients in submitting forms to private pet insurance plans. All of us at Park Pet Hospital are grateful for the support we've received from the communities we serve, and because of that we try to give back as much as possible. Our staff members donate their talents to several community organizations. We offer tours of our facility to school groups and Scout troops, and we also speak at many classroom career days. In addition, we enjoy hosting students interested in experiencing a day at a veterinary hospital, as well as providing student internships to help educate the next generation of veterinary practitioners.